The Institutional Development Award (IDeA) program broadens the geographic distribution of NIH funding for biomedical research. The program fosters health-related research and enhances the competitiveness of investigators at institutions located in states in which the aggregate success rate for applications to NIH has historically been low. 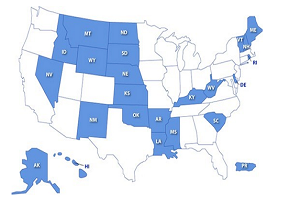 The program also serves unique populations—such as rural and medically underserved communities—in these states. The IDeA program increases the competitiveness of investigators by supporting faculty development and research infrastructure enhancement at institutions in 23 states and Puerto Rico. This text and graphic are from the National Institute of General Medical Sciences website. Please visit this link to learn more about the IDeA Award program. The Great Plains IDeA-CTR Network is part of NIH’s larger IDeA initiative, established in 1993, that includes 5 programs for promoting and improving health-related research in states where rural and underserved communities are abundant. These programs share the common goal of strengthening biomedical research through individual focus on collaboration, education, inclusion of traditionally underserved populations, and leveraging research infrastructure and networks across the country. For more information about the IDeA programs click on the links below. IDeA Networks of Biomedical Research Excellence (INBRE): statewide institutional networks that work together to leverage existing research resources and increase the quality of scientific rigor among faculty at research and undergraduate institutions to better prepare students for careers in biomedical science. Centers of Biomedical Research Excellence (COBRE): multidisciplinary centers led by collaborative scientific experts focused on enhancing an institution's research capacity around a given theme, such as a specific disease or established research facility. IDeA Program Infrastructure for Clinical and Translational Research (IDeA-CTR): focuses on enhancing clinical and translational science via a network of IDeA-states to improve research infrastructure, increase the number of competitive grants, and enhance collaborative research projects that include traditionally underserved communities. IDeA Co-funding: focuses on supporting investigator-initiated research projects in IDeA-states that may be too expensive for a single NIH center to fund. IDeA States Pediatric Clinical Trial Network: as part of the NIH Environmental Influences on Child Health Outcomes (ECHO) Program, the IDeA States Pediatric Clinical Trial Network focuses on improving pediatric clinical trials through collaboration, shared infrastructure and networking.